A house with artistic protection, safeguarded by Santa Notburga – does that sounds honourable and serious? Exactly. That’s just how it is. It’s also fascinating and inviting, generous and relaxing. It pampers you with a finely balanced blend of luxury and tradition. Chalet Leckplått is spread over two floors and 135 square metres, offering six to eight beds, two bathrooms, a kitchen, living room and the “Stube” (lounge) with the much sought-after bench to lie down in front of the wood-burning stove. The walls are thick and windows and rooms are small and cosy. 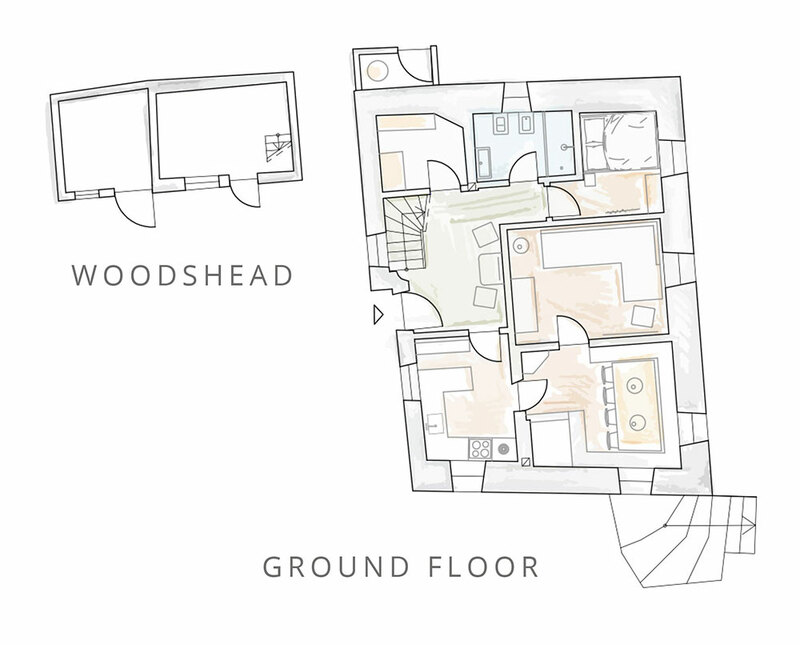 Something special can be found beneath the house and outside: the rock cellar for wine tasting, the sauna and the playhouse, and of course, the garden, which extends up to the three larch trees. Behind, less than 100 metres away, lies Chalet Zoila. 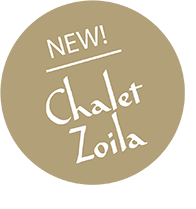 Prices are calculated per night for the entire chalet for six guests with a minimum stay of 3 nights. DAILY FRESH BREAD: The master baker from the village delivers daily fresh bread and milk for your breakfast – if you order on time the evening before. On request we will prepare your breakfast. WARM FEET, SILENT SOLES: The best feeling after coming home: Take off your shoes and slip into the „Filzpatschen“ felt slippers! Don’t worry: We have enough for everyone. LET US COOK FOR YOU: Immerse yourself in our kitchen: We’ll cook for you traditional and local favourites such as Speckknödel bacon dumplings, Schlutzkrapfen ravioli or Muaß mush with recipes that have been passed down our family for generations. HEALING MASSAGES AND PHYSIOTHERAPY: Necessary or just delightful? A massage will always do you good, physiotherapy is beneficial and refreshing. We will gladly arrange for a visit from a physical therapist and transform the Chalet Hafling into your personal spa. VISIT THE FARM: Our farm is located in Meran, close to Hafling. We would be happy to take you through our orchards and vineyards, and invite you to a wine tasting afterwards. Even though we are not located directly in Hafling, we will be pleased to assist you with advice and practical help. ARRIVAL / DEPARTURE: On the day of your arrival, the Holiday Chalet will be available from 3:30 pm. On the day of departure we ask you kindly to vacate the Chalet by 9:30 am. PLEASE DO NOT SMOKE: For safety reasons, no smoking is allowed in the entire house. We ask our guests to kindly smoke exclusively outdoors, and to use the available ashtrays. PETS: Pets are allowed on request (extra cost)9. PREPAYMENT & BOOKING: The booking is binding upon receipt of the prepayment and the sending of the booking confirmation. The booking confirmation will be sent in written form by mail or otherwise. PAYMENT OPTIONS: You can pay with cash as well as with bank card / debit card and credit card. The deposit will be retained in any case. A real solid wood farmhouse parlour from the 17th century with paneling made from pine, larch and spruce creates a warm welcome when you walk through the door. The large tiled stove offers irresistible comfort in every season, as desired. Be embraced by its inviting cosiness. The dining table is very accommodating. Large and wide, stable and strong. It’s great for all banquets, for every breakfast, every “Marende” with bacon and cheese (and a good glass of red wine), for Knödel with soup and apple pie. From drawing and colouring to newspaper reading, and… even the odd bang on the table when ithas to be done! There’s plenty of space for many people, when gathered together in friendly company. A good kitchen is a “must have”! And what a treat to find the comforts of the 21st century hidden in this traditional listed building. Everything is provided to conjure up a breakfast buffet (TIP: You can request to have fresh bread delivered! ), light lunches and hearty dinners after a day out in the open air. All our equipment and utensils are new, fresh and clean. On a traditional note, we have an additional stove, which is fired with wood, and as is customary in all farmhouses, there’s a kettle always on the boil. The chalet has five bedrooms. 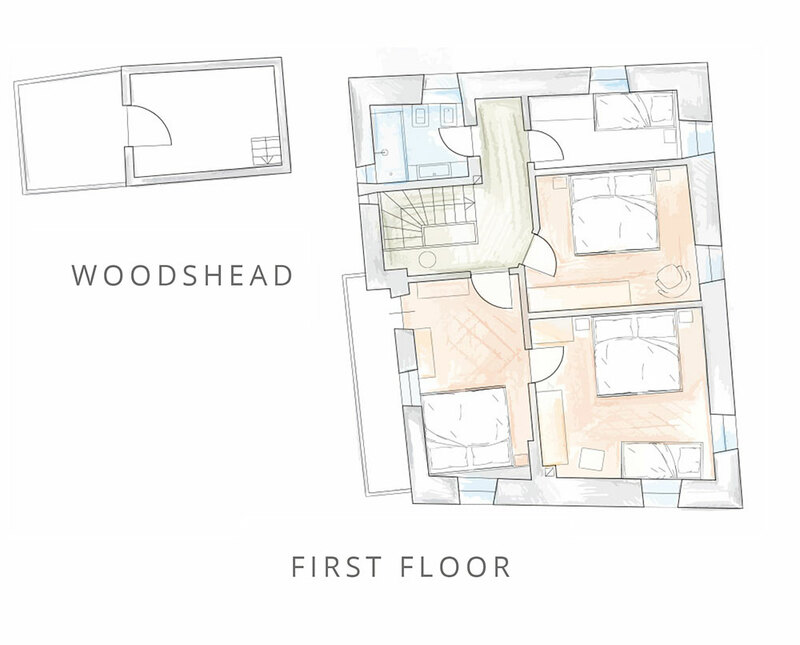 One bedroom is located on the ground floor, the others on the first floor. Two bathrooms make cohabitation easy. Wooden floors, sleek design with high-quality, local materials such as natural stone, lots of wood and high quality natural fabrics gives each bedroom its own personality. Every child’s dream – two little houses complete with terrace – all in the heart of our garden! However, they’re not just for little ones but for grown-ups too! The Sauna: Charged after spending a wonderful day in the fresh air. Whether from the nearby slopes or from a harmonious woodland walk, your mind is filled with lingering images. Yet, the desire is to relax now and think of nothing… Welcome to our sauna. Our sauna is unique. Custom-made interior and exterior design, wrapped in wooden shingles, overlooking the mountains of Merano and the Avelengo plateau. Handcrafted, using locally sourced larch and pine, it illuminates your eyes, relaxes your body and your soul! The sauna stove is heated by the wood in the room itself and the cooling guarantees a shower in the entrance. Choose from the garden or the newly built playhouse, your relaxation zone. Wrap yourself in soft and embracing sauna towels and reconnect with your body. Do nothing. 3,000 square metres of garden surround the house on the Leckplått. Enough space to seek out solitude and enough space to create a little holiday oasis to please young and old alike. A sandpit and swing, hammock and “slackline”, bouncing balls and board games and marvellous deckchairs! There’s a big long table, perfect for hosting an evening barbecue (gas or traditional woodburning) or just a quiet evening sitting in silence watching the dancing flames of a bonfire, listening to the sweet whispers of the wind. Everything that blossoms and grows on our land is happily shared with our guests. Pick some fruit, berries or herbs, savour the summer and taste the autumn. 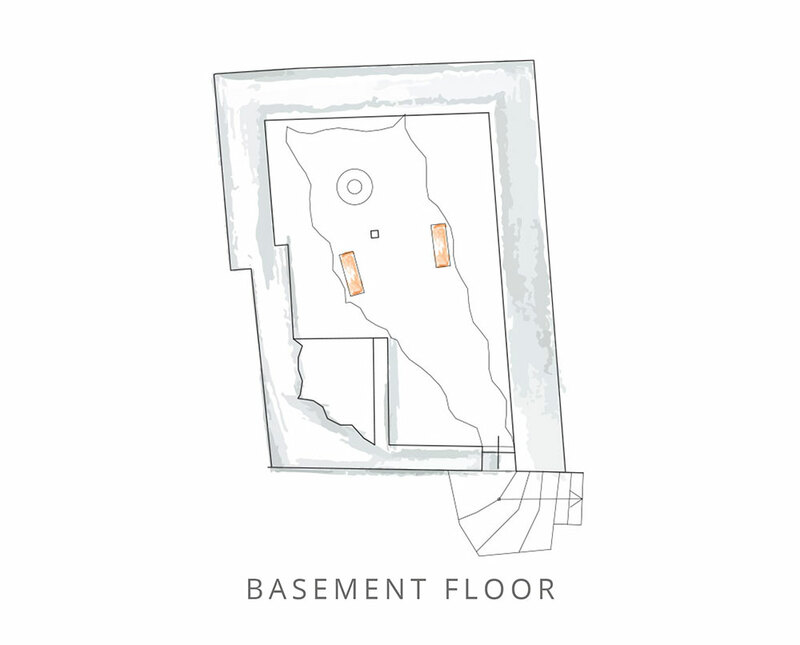 The cellar- the basemant rock ist our foundation. The rock is cool, strong and solid. Undoubtedly the perfect air conditioning system for a quick cool down, served with a good glass of wine. The selection is vast. The wisdom of the cows … we can but learn from them, by gathering in a place where the sky and the earth connect by special forces. For one hundred years the Leckplått was the place where cattle were drawn together, naturally and peacefully. Simply standing side by side, perhaps sheltering from a threatening thunderstorm, to lick the earth searching for its delicious salt. There must be something to it, there is something to it. Without a doubt.